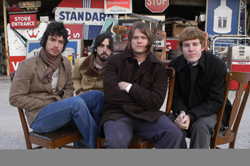 A keen move on their part, the once Amsterband from Missouri is now known as Ha Ha Tonka. The band is made up of Brian Roberts on lead vocals and guitar, Lucas Long on bass and vocals, Brett Anderson on keyboard, guitar, and vocals and Lennon Bone on drums and vocals. This indie rock band combines religious undertones, life, love, hometown pride and rockin guitar riffs. I had the opportunity to talk with Brian Roberts about their past, present, and future projects. When I talked to him he told me that he was laying on the beach in Santa Barbara. To my response that I was just in Waukesha, Wisconsin, he responded, “Waukesha is gorgeous though. I think Wisconsin might be the most underrated state in the nation. People are just ripping on Wisconsin and it’s gorgeous! Well, I guess [it’s bad] in the winter but other than that!” And yet, he has moved many miles since the band’s inception. In the works is a new album, once again working with McEntyre. How soon can we expect to see a new album? Roberts says, “Well, we have some songs written. We did 10 demos with Jason and we’ll go in again and record some more. We’d like to go in with 15 or 16 songs and make another 10 song album.” They are set to record it in November or December. So look for the new album around April or May of ‘09. They are going to be in Wisconsin a good deal during the month of September. Look for them at the Southern Comfort Music Experience Festival on Willow Island at the Alliant Energy Center on September 6th at 4pm. Also, watch for the tour coming with Backyard Tirefire as well. Roberts says, “I had known of the band and they were releasing a new album and I think it just worked out that we were needing to do another Midwest tour and they were willing to take us on so we’re glad to be on that tour.” Ha Ha will be in Milwaukee at The Rave on September 11th at 6pm and in Madison at the Annex September 12th at 9pm.